Will Colin Curtis soon be roaming LF at Yankee Stadium? Update: Curtis Granderson has been diagnosed with a grade II groin pull strain. According to sportsinjuryclinic.net, a grade II strain is a moderate tear that can involve anywhere from 10% to 90% of adductor muscle fibers. The injury ensures that Granderson will miss at least 15 games, although as much as a month is possible. In the sixth inning of today’s game, Curtis Granderson pulled up lame while running from first to third on Brett Gardner’s single. Although the results of an MRI are still pending, early indications are that a DL stint is forthcoming. Although he had been struggling, losing Granderson not only weakens the lineup, but also compromises the defense. Because Randy Winn’s roll on the team has almost been reduced to observer status, Thames is the likely choice to play LF. The defensive fallout from that move could be considerable. 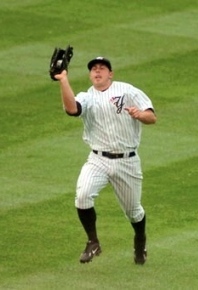 Regardless of the revised alignment, the Yankees will need to call up a reinforcement. Greg Golson and Chad Huffman are the only two outfielders in the minors who are currently on the 40-man roster. Both right-handed hitters have been struggling, however. In 59 PAs, Huffman has a line of .204/.232/.436, while Golson is hitting .275/.296/.478 in 71 PAs. Golson, who has limited major league experience, also adds an element of speed as well as more experience in centerfield. Should the Yankees decide that Granderson’s absence will be long enough to warrant an addition to the 40-man, two other likely candidates for a promotion are Scranton’s David Winfree and Colin Curtis. Curtis, a lefty like Granderson, has been one of Scranton’s more productive early season hitters. In 67 PAs, he is hitting .339/.434/.441. Curtis has also been playing mostly LF, another factor that could be in his favor. Unfortunately for Curtis, on April 29, he was placed on the 7-day minor league disabled list with an ankle injury. If the Yankees decide to promote a bullpen arm before addressing their outfield situation, Curtis could return to action in time to gain the promotion. If not, Winfree, a right-handed batter and right fielder, could get the nod. In 77 PAs, Winfree is hitting 300/.350/.486.